Slow Cooker BBQ Pulled Pork. It doesn’t get much easier than this! I love coming home to a tasty and hearty meal of crock pot barbecue Pulled Pork. 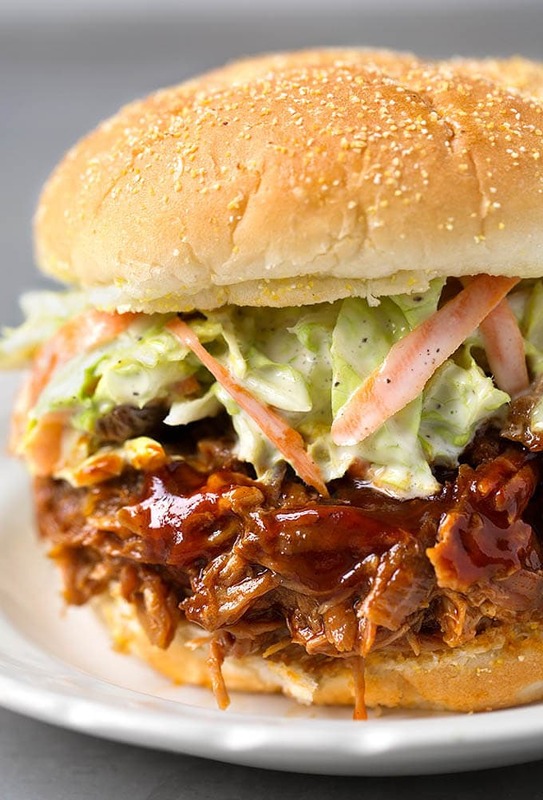 We like it piled high on kaiser buns, and topped with extra bbq sauce and a simple Creamy Coleslaw. Today was really busy. Chores, work, and the added extra clean up of ash. I knew it would be a slow cooker meal day. With all of the fires in our state (Washington), and neighboring states, the smoke and ash have been dreadful. Again. This happened earlier this summer from the Vancouver fires, only we didn’t have any ash. Just lots of smoke. I left the living room window open last night and ash came in through the screen! I had fun vacuuming that up! But I don’t mind, it could be worse. We could be in the path of those wildfires. No thank you. My heart hurts for the people who have lost everything to those fires. We haven’t had any rain to speak of, so it’s a lot drier than normal. Then on the opposite corner of the country there is Harvey and Irma wreaking havoc! Sheesh! Crazy! 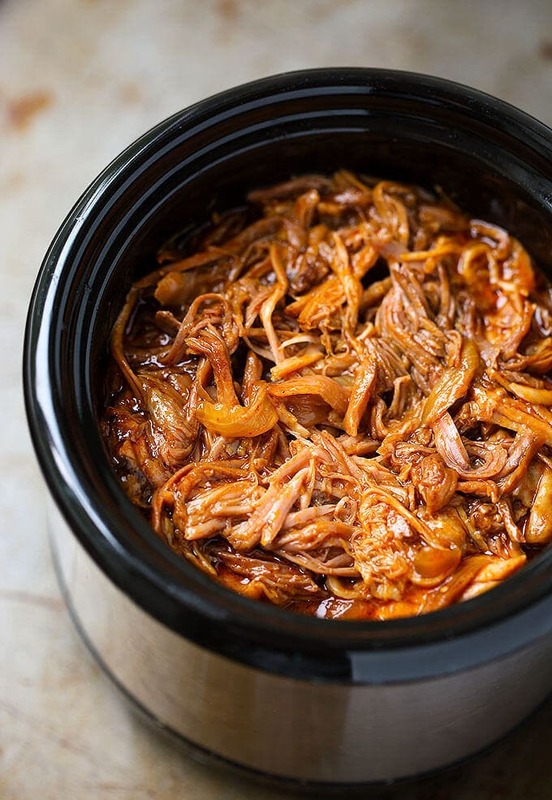 My recipe for Slow Cooker BBQ Pulled Pork is a pretty simple one. I have a few pulled pork recipes, but this one fit the bill today because it is so quick to throw together. Plus it cooks all day if you use the Low setting, and I was able to get stuff done! Many people have lost the use of their kitchens, so having a slow cooker or an Instant Pot is going to allow them to make meals for their families while they have so much to deal with. 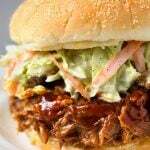 Slow Cooker BBQ Pulled Pork is an easy meal you can make in your crock pot / slow cooker. Just a few simple ingredients and you will have a delicious meal to satisfy the whole gang! Add onion, barbecue sauce, and chipotle, if using. Stir. Rub pork shoulder with the salt and the spice rub. Place pork shoulder in the slow cooker with the fat side up. Cook on Low for 9-10 hours, or High for 5-6 hours. If you can, stir the sauce about halfway through and turn the meat over. It will be fine if you don't. After cooking, scrape off the fat layer and discard. Remove the meat to a large plate and shred it using two forks. Skim some of the fat off of the top of the juices in the pot, using a large spoon. Return the meat to the crock and stir to combine with the juices. Add a little more bbq sauce if needed. Serve on toasted burger buns. Top with my Easy Creamy Coleslaw. This sounds delicious and easy. 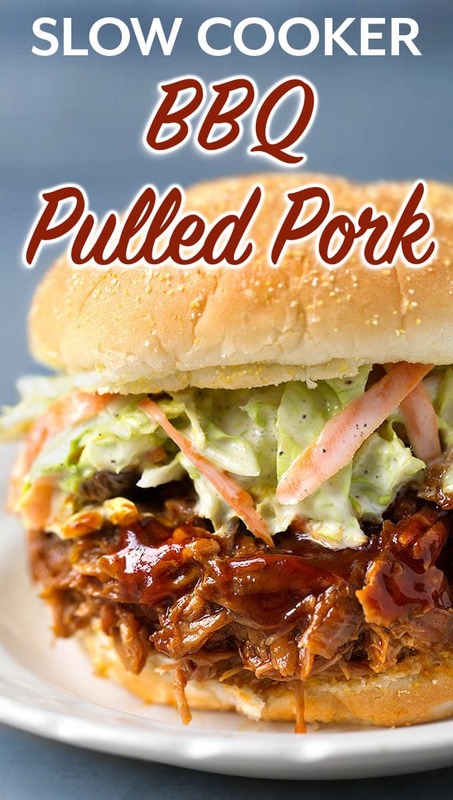 Have you ever tried this pulled pork recipe in an Instant Pot. If so, what changes need to be made? Hi Jill, I have made an IP version of this, but hadn’t really made a recipe from it. I do have a pulled pork IP recipe that uses Dr. pepper, and is really good. I would rub the pork with the spice rub, cut it into a few chunks as you did with the Mississippi Pot Roast, and put it in the pot with a cup of broth/water. Cook time will depend on your pork shoulder, but use my pulled pork recipe as a guide. Then remove the pork, pull it, and add your favorite BBQ sauce to it. We really liked this pulled pork. The barbecue flavor was a nice change from typical pulled pork. We had company over and everyone went back for seconds! Hi Amy, that’s awesome! When your guests go back for more, you know it’s good! Thank you for your review!